Should you continue with a browser that is out of date, your experience using TTBizLink may not be ideal. We recommend that you update your browser by clicking on the icon below. We notice that you're using an unsupported browser! Should you continue with an unsupported browser, your experience using TTBizLink may not be ideal. We recommend that you download one of the supported browsers by clicking on one of the icons below. This service allows importers/exporters to apply electronically for trade permits and licences from the (i) Ministry of Agriculture, Land and Fisheries (MALF) - Animal Production and Health Division, and Plant Quarantine Services; (ii) Ministry of Health (MOH) - Chemistry, Food and Drugs Division: Food and Drug Inspectorate and Pesticides and Toxic Chemicals Inspectorate, and the Pharmacy/Drug Inspectorate; and (iii) Ministry of Trade and Industry (MTI) - Trade Licence Unit (TLU). The Ministry of Trade and Industry (MTI), through this service, allows companies seeking IDCs to complete the necessary application forms and upload supporting documents online. All applications are then processed electronically by the MTI with dynamic feedback provided to the applicant as required. The e-Company Registration service will enable online submission and tracking of Business Registration and Company Incorporation applications/documents to the Registrar General's Department of the Ministry of the Attorney General and Legal Affairs for processing. This service will also enable an online Name Search and application for Name Reservation. The e-National Insurance Board Registration service will enable online submission and tracking of Employer Registration(NI 1) and Employee Registration(NI 4). This service allows partnerships and companies to apply online for a BIR File Number and VAT registration as issued by the Board of Inland Revenue of the Ministry of Finance. The e-Certificate of Origin (CO) service allows exporters to apply for COs issued by the exporTT Limited (exporTT) or the Trinidad and Tobago Chamber of Industry and Commerce (TTCIC) through an online application and processing. The Ministry of Trade and Industry (MTI), through this service, allows companies seeking FIs to submit the necessary application forms and upload supporting documents online. All applications are then processed electronically by the MTI with dynamic feedback provided to the applicant as required. This service enables companies/businesses and individuals to electronically submit Work Permit applications to the Ministry of National Security (MNS) - Work Permit Secretariat (WPS). All applications are then processed electronically by the MNS with dynamic feedback provided to the applicant as required. The e-Maritime service allows local shipping agents to electronically submit vessel pre-arrival and departure documentation to the Maritime Services Division, Coast Guard, Port Administrations, Immigration Division and Ministry of Health using harmonized web forms. Once submitted the information is immediately routed to these agencies in the prescribed format for review and approval. This e-service enables the Importer/Exporter, or authorized agent of imported goods, excluding non-commercial or carrier/postal packages, who has submitted an electronic customs declaration (e-C82) to the Customs Border Control System (Asycuda World) to obtain regulatory approvals/endorsements from the Trade Licence Unit of the Ministry of Trade and Industry; the Food and Drug Inspectorate and the Pesticides and Toxic Chemicals Inspectorate of the Ministry of Health; the Plant Quarantine Service of the Ministry of Agriculture, Land and Fisheries; and the Trinidad and Tobago Bureau of Standards. This service enables companies and individuals to submit online applications for: (i) Building Development Approvals and Plumbing Approvals from the Water and Sewerage Authority (WASA); (ii) New Electricity Supply from the Trinidad and Tobago Electricity Commission (T&TEC); and (iii) Electrical Inspections from the Government Electrical Inspectorate (GEI). Applications are processed electronically by the relevant agency, with feedback provided to the applicant, as required, via email or an optional SMS. This service enables the master of every aircraft or ship or his agent and every cargo reporter to prepare and submit cargo manifest data to the major Ports in Trinidad and Tobago through a secure system to system link. Please be advised that on Friday April 19, 2019 and Monday April 22, 2019 the TTBizLink Help Desk will only be available by email at support.ttbizlink@gov.tt. Kindly therefore send your matter through this media and it will be attended to on the next working day. We do apologise for any inconvenience that this may cause. Normal working hours resume on Tuesday April 23, 2019. The TTBizLink family also takes this opportunity to wish one and all a very Happy Easter. The Ministry of Agriculture, Land and Fisheries is pleased to advise that, with immediate effect, neither a plant import permit nor a phytosanitary certificate will be required for the importation of the following commodities: Corn Grits; Tapioca; Cooked Cereal; flour and industrial products made of cereal or oil seeds; and processed animal feed. For further information, and any queries that you may have, please contact the Plant Quarantine Services, Central Experiment Station, Centeno at 642-0718 or 642-6008. MTCC Reporting Form Updated The shipping community is advised that the MTCC Reporting Form has been updated. This is for immediate use. As indicated in Shipping Notice 1-2017, it has to be completed and uploaded when submitting your declarations through TTBizLink. 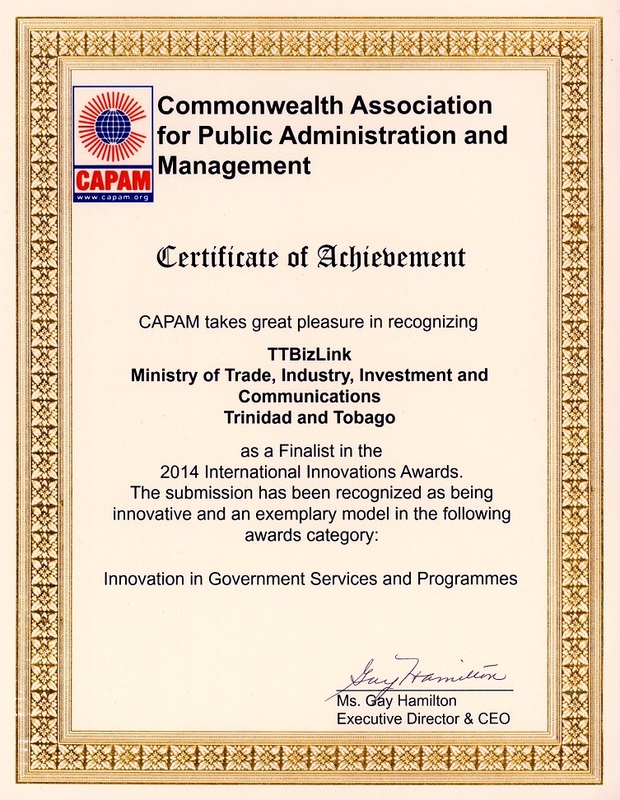 TTBizLink and Trade Licence Unit (TLU) of the Ministry of Trade Industry, Investment and Communications (MTIIC) have both been awarded Diamond Standard certification.